The communist youth unions in the Department of Culture and Sports, the Department of Information and Communications, HCMC Television and Sai Gon Giai Phong Newspaper yesterday gave a bookshelf with more than 3,500 books, newspapers and gifts to children in distant Duong Minh Chau District of the southern province of Tay Ninh. 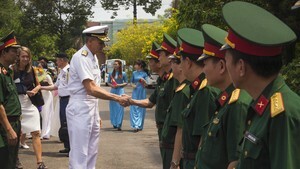 Members of the unions arrived in Tay Ninh Province to visit a military base during Resistance War against America. This is one of big military bases in the South Vietnam during war time. Union members granted a book shelve including over 3,500 books, newspapers and gifts to kids in Phan Commune, a disadvantaged area of the province. 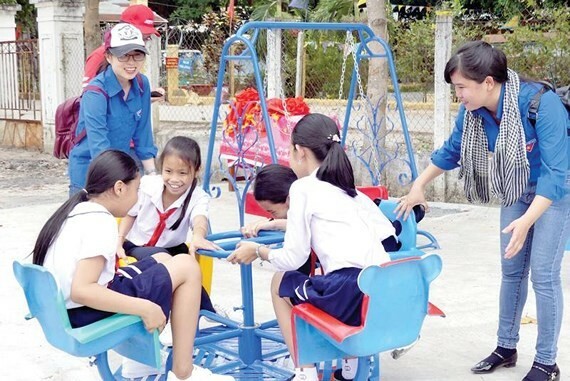 On the occasion, the Department of Culture and Sports and its partner in Duong Minh Chau District inaugurated an entertainment park worth VND90 million ($3,875) for kids from five to 12. Before, Sai Gon Giai Phong Newspaper's communist youth union and the youth employment center in HCMC visited Dinh Mountain revolutionary base to understand more about former union members’ struggle as well as painted memorial stone and guidance signs and clean the base.